Some of you were wondering what a soap opera was. Here is a very popular soap in England. It's called Eastenders (Location : East of London). The first episode appeared on TV (BBC1) in 1985, 27 years ago! 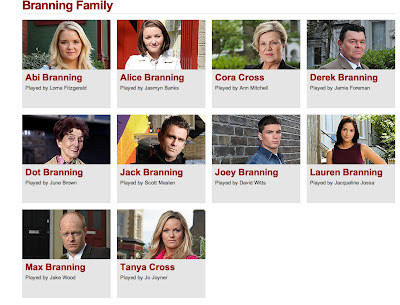 Click on the picture and find out who's who in the Branning family. (whose grand mother? whose daughter?...) Write the answers on your copy book. There is another soap opera which is as famous as Eastenders in England. Browse the net and find its title.